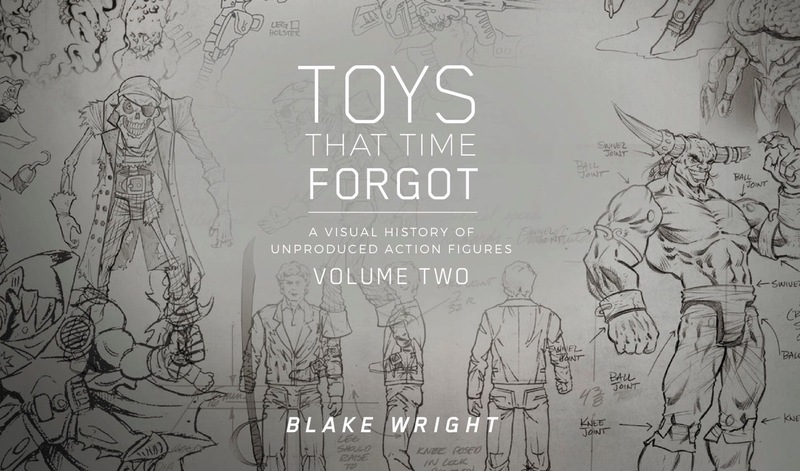 If you’ve been following the blog or podcast at all, you’ve undoubtedly heard us mention Blake Wright’s TOYS THAT TIME FORGOT book. It’s a book packed with deep history and photos of toys that never saw the light of day. In addition to the incredibly content, the first volume is incredibly well-designed and is a stellar coffee table book for any toy lover. That said, I was beyond excited when Blake mentioned he was working on Volume 2. If you’re on the impatient side like I am, you’ll be pleased to know that you don’t have to wait after reading the press-release below! The Kickstarter is available now, with the book being delivered in the Fall. I can’t stress enough how amazing this book is going to be- there have been a few sneak peeks at the lines featured, and it is surely going to be just as good (if not better) than Volume 1. For those that know me well, you know that I wouldn’t make these kinds of claims if I didn’t mean it- this is not a paid advertisement, nor am I receiving any compensation. Blake is a good friend and a great steward of the hobby, and I’d love nothing more than you all showing him you support for the work he’s done on these books! make it to retail shelves, as well as those that did hit stores, but had plans for additional toys canceled. inventor-based products… some of which again have never been seen by the public. book will be $50. There is also special pricing available for retailers desiring multiple copies. Previous PostMighty Max, Toylanta, and Former Employees, Oh My! Next PostAll things action figure grading - When should I grade my figure?